I made this lovely cocktail ring by setting a freeform-cut kyanite gemstone in a sterling silver bezel. The bezel has a pretty pattern around its edge. 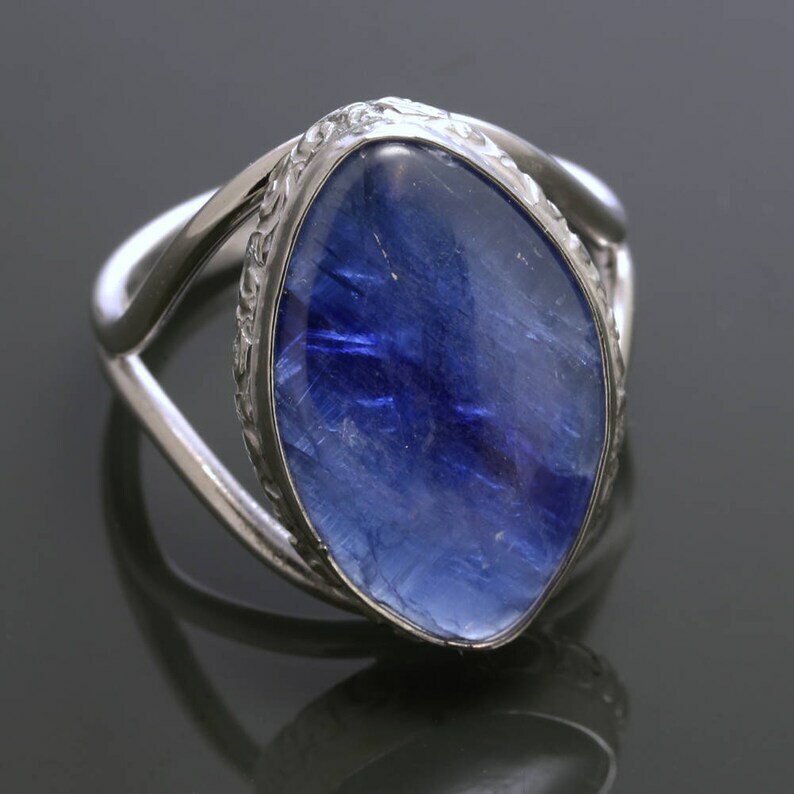 The kyanite is a great cornflower blue color with a silvery shimmer. I chose not to back the stone with metal, so light can come through (see second photo). The ring band is made of two pieces of sterling silver that come together in the back. All of the metal in this ring is sterling silver (925). Please select your ring size and stone choice when you check out. Please allow 1-2 weeks for me to make your ring before shipping. Please note that this ring is custom-made and is not eligible for refund or exchange. See my Policies section or contact me for sizing information. Sterling Silver Solitaire Ring. Genuine Gemstone. Tapered Bezel Setting. Beveled Band. 5mm Faceted Round. Customized. Garnet Ring. Thicker Stacking Ring. Square Cross Section. Sterling Silver. Made to Order. Stackable Ring. Minimalist Design. Mother's Pendant / Grandmother's Pendant. 4 Birthstones. Sterling Silver Necklace. Natural Gemstones. Teardrop. Customized. Gift for Her.